Discover the thrill of scuba diving by signing up for a single day trip to Amed, Bali. You will undergo a practice session in a swimming pool where you will learn to use your scuba gear, before diving into the turquoise water of the Bali sea. A certified instructor will be there to guide you throughout your dives. This scuba diving trip offers you two shore dives. Since the dives are shore dives, they are easy and ideal for beginners. After the dives, you will receive a PADI certificate and credits that can be used towards your PADI Open Water Diver course, if you choose to pursue it. 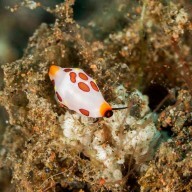 NOTE: This Discover Scuba Diving trip at Amed, Bali can be undertaken by non-swimmers as well. Amed, one of the seven villages in the eastern shore of Bali, is popular amongst beginner scuba divers, on account of low water currents. Diverse corals and different species of fish are easily spotted just below few meters of the surface. This feature makes many of the dive sites in Amed, such as Jemeluk Bay and Bhuntan Point, a great site for snorkelling as well. The clear blue water near the Amed provides good visibility of shore dives up to 25 meters/82 feet, offering an enriched experience to thrill-seeking scuba divers. • Dive in the calm waters of Amed, suitable for non-swimmers. • See a wide variety of corals and fishes in the Bali sea. Your pick-up will arrive to take you to the dive centre in the morning. You'll be heading on a 40-min drive to the dive centre in Sanur, where you will learn the basics of scuba diving. The journey from the dive centre to Amed on a car is approximately 2 hours and 30 minutes long, but the drive is comfortable and full of scenic beauty. 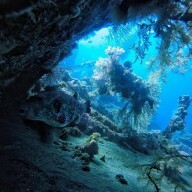 Over the course of the day, you will complete two open water dives from the shore of Amed beach. An appetizing lunch with snacks will be served in between your dives. You'll head back to your dive centre in Sanur by late afternoon. Your trip ends here. Swimming pool at the dive centre. A pick-up and drop-off is offered between the hotel and your dive centre. Please inform the tour operator the exact address of your hotel or place of accommodation before your trip. Today's meal package includes lunch. You'll be picked up from your hotel in Sanur, Kuta, Seminyak and Nusa Dua for this Bali scuba diving trip. If you're not staying in one of the aforementioned areas, you'll have to make your own arrangements to get to the dive centre.